What will the recorded message that my neighbors hear sound like, what information do you include? How quickly after I place my order will you phone my neighbors? Most lost pet orders are processed within one hour. If this is during our alert messaging times then all calls will be sent out immediately after processing. Otherwise your calls will go out as soon as the broadcasting time starts. Our automated calling system can send out any amount of calls within 1 hour. We do our best to get calls out ASAP as we understand that if we act quicker, it can increase the probability of finding your pet. What hours are the alert broadcasting calls made to my neighbors? Our Alert Broadcasting Times are Mon-Fri 10AM to 7PM and Sat-Sun 10AM-6PM. These times are applicable to the time zone you are in. These times are also the best time to reach your neighbors at home. Do you guarantee to find my lost or stolen pet? Although we do our best to find your lost or stolen pet, we cannot guarantee that your pet will be found. We also cannot refund you if your pet is not found. Our service is an effective way to find a missing pet, but of course no guarantees can be made. Can you leave a message on an answering machine? Yes, when we get an answering machine, we leave our message with your missing pet and contact information. When a live person answers the call, we play the message with your missing pet and contact information. Our toll-free number also is displayed to people who have Caller ID, so many times they will call us back as well if they didn't previously answer. Our service is classified and registered as an exempt organization by the DNC (Do Not Call Registry). What if my neighbor is on The National Do Not Call Registry (DNC)? LostMyKitty.com, LLC is classified and registered as an exempt organization by the DNC, thus we can phone your neighbors who are on the Do Not Call List. This is not an issue. Our proprietary system will call the main emergency number that is on file with the credit bureaus and/or the utility company. This will include cell phones, mobile devices and voip phone systems. How large and accurate is the list of phone numbers used by LostMyDoggie.com? We have a database of over 210 Million U.S. telephone numbers, with over a 90% accuracy rate. We maintain our database monthly to continually update it and keep it accurate. Can you guarantee that my pet's name is not mispronounced on the recorded phone message you broadcast? Although we do our best to pronounce your name as well as your pet's name, mispronunciations can happen. This is not as important as you might think though, the most important thing in locating your pet is for you to accurately fill out the missing pet information form and including a picture, this is crucial to locating your pet, much more so than the pronunciation of the names. How will I know the calls really were sent out and to the correct area? You can always login to your account and see an updated status of your pet alert message. It will be updated once calls go out. Also upon request, we can provide you with a detailed call log of all calls that were sent out. How long does it take your automated calling system to make all the calls in my package? Most calls can be sent out usually within one hour. If I live in an apartment complex or condo, will my neighbors receive the alert? Yes, our extensive database of phone numbers includes apartment complexes and condoes. It does not include business phone numbers so businesses in your area will not be notified, but neighbors in your area will. I put in the wrong pet information, how do I change it? NOTE: IF the pet alert message has already gone out, it cannot be changed. Please first login and make sure the alert message has not already been broadcast. If it hasn't you can still change it simply by logging into your account and editing the missing pet information. You can also email us at [email protected] or call us at 877-818-0060. For your mailing program, what types of businesses receive the flyers? We notify all types of pet related business that include, but not limited to, animal hospitals, veterinarians, animal shelters, rescue groups, pet stores, pet groomers, dog walkers and trainers, and other pet related businesses. For your mailing program, how do we know you really mailed the flyers? Upon request we can email you the complete name and address list (including phone numbers) of the pet businesses we mailed flyers to. 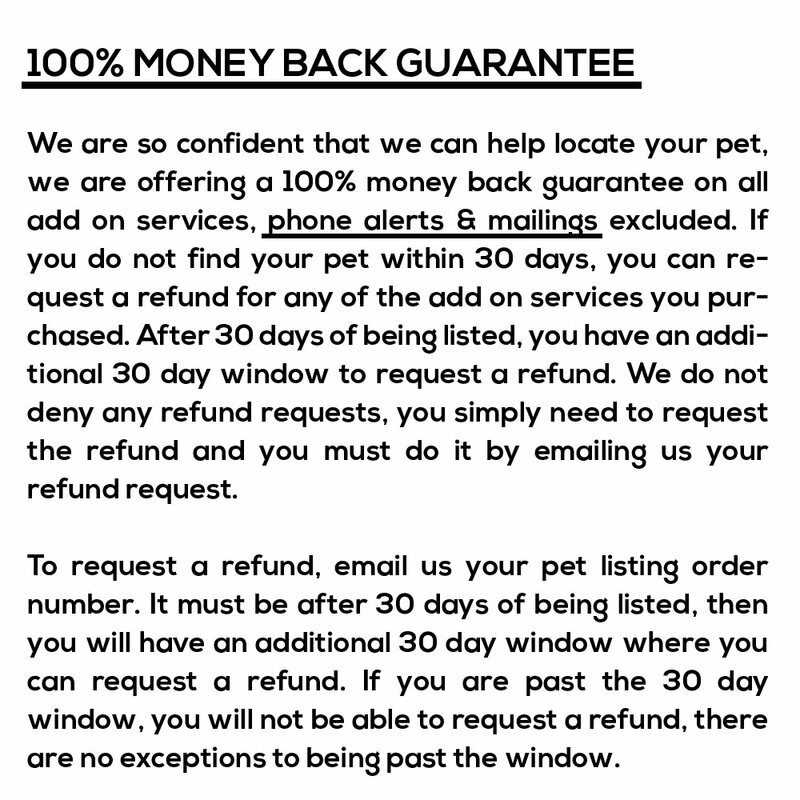 You can then verify with them that they received a flyer from us about your lost pet. How do we know lostmydoggie.com is not a scam? Is LostMyKitty.com a scam? Or, "Is LostMyKitty.com legit?" ... "Has anyone used LostMyKitty.com before?" We think they're fair questions. We're proud of the positive experiences our customers have had with our company. LostMyKitty.com has been using our pet amber alert system online since 2008 and has been instrumental in locating 1000's of lost pets. We are Paypal and GeoTrust verified and we can provide any other credentials to put you at ease. We can also give you detailed phone and address logs of all amber alerts we send out. If you still think we're a scam please review our 100's of success stories or simply give us a call at 877-818-0060. You can also read independent 3rd party reviews on Google.com HERE or at this other independent 3rd party HERE.